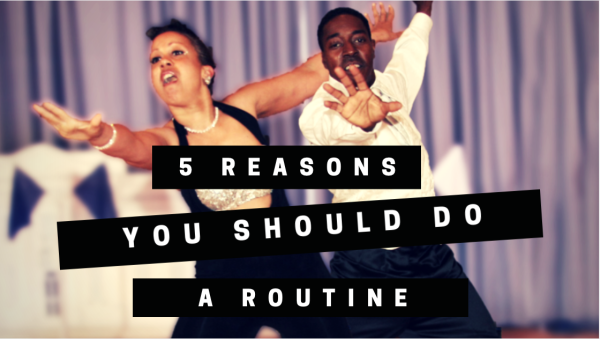 Here are 5 things you’ll get out of a West Coast Swing Routine! The first and most obvious thing you will get out of a routine is an increased skill set. Because of the dedication and consistent practice required by a routine, you will get lots of practice time on your choreography. This will allow you to learn new skills. Over time your will develop consistency with your new skills and will be have upped your game in the process! I often times put challenging choreography that my students can grow into as we practice the routine. Dancing a routine all by yourself with everyone watching is no joke. The practice required to pull off over 2 minutes of choreography is substantial. It requires consistent organized practice time. There will be a time to pick a song. There will be a time to create an idea for the style of the routine. There will be practices to only work on choreography. There will be practices to work on the difficult moves. There will pre practices simply dedicated to getting ready for the performance. Organizing all of these elements is a different skill that what is required to practice for social dancing of Jack & Jills. Wether you routine is with an amateur partner or a professional partner you are in a relationship of sorts. You will be spending many hours working on your routine together. You will have to navigate personal schedules, bad days and bad practices. Developing your abilities in dealing with these situations is something unique to this style of partnership. Its much like a relationship, you have to work together for a common goal in good times and in bad. Look at the top West Coast Swing couples today. One of the secrets that no one talks about is the consistency of their partnerships. They continue to perform year in and year out even though its sometime difficult. Mastering your mind is one of the hardest things to do in dancing. Performing a west coast swing routine with everyone watching brings up a lot of emotions. Perhaps you’ll get nervous and not perform well. Perhaps you’ll make a mistake and need to keep a poker face as you recover. Learning to understand and control the emotions that pop up during the process is one of the most important things you will gain from the process. Putting yourself out there in a routine is something special. We are all unique dancers and unique people. The journey of creating and sharing a routine with an audience is an emotional process. When done well it can connect and inspire others. The uniqueness that you bring to a routine will relate to people differently than other dancers. By putting in the hard work and performing for an audience you might just inspire another person to try a routine. I promise when the first person comes up to you and tells you how much they were impressed and inspired by you, it will make all the hard work worthwhile!